We are approaching an exciting time of the year for Jews all around the world. 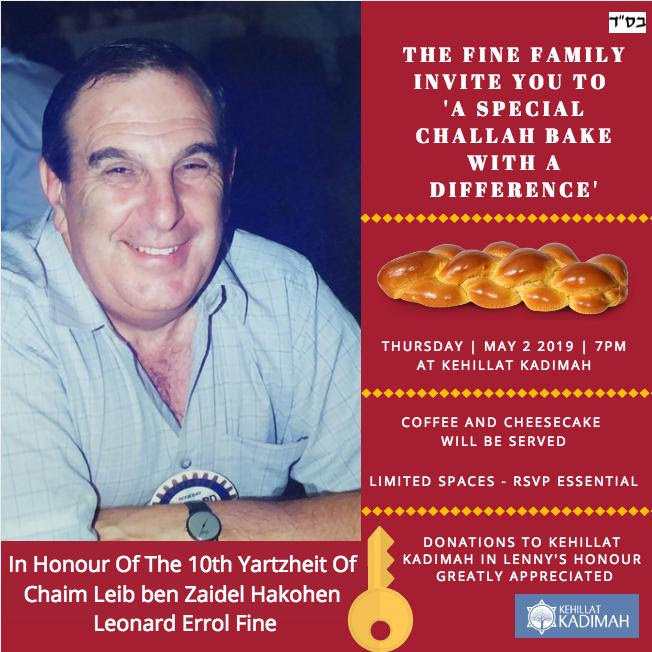 It is a time in which we gather together with our families, focus on our Jewish values and of course satisfy our latent neuroses with some therapeutic over-the-top Pesach cleaning. On a communal level the last few months have been a time of growth and hard work. The team here at Kadimah are working hard to lay the foundations for a flourishing and thriving community. Purim was a phenomenal day, with approximately 150 children attending our kids’ programme as well as a sold-out Purim banquet with comedian Ashley Blaker. Our Bar Mitzvah programme with 12 boys and their fathers was well received and our Bat Mitzvah program is still ongoing with great enthusiasm from all participants. Shiurim are growing and we are excited to continue to announce further classes and events as we continue to grow. On a personal level, we celebrated the birth of our third child, Ariel, and we have been overwhelmed by the warmth and generosity expressed by the community at the time of his birth and Brit Milah. As I reflect on these achievements I recognize with awe the great efforts that are contributed from so many here at the Shul. It is important that, as a community, we pay homage to those who put their heart and soul into our community. First and foremost, our President Josh Bolot and his team on the board: It is a testament to your enduring hard work that the Shul is growing every day. Rabbi Niassoff and Rabbi Simons: for all the communal work you do, leading the services, laining and shiurim. My wife Rivkah, who does so much work behind the scenes: thank you for all your support and commitment to the community. Our team at the Shul, Karen Fried, Mervyn Katz, Reuven Boskila, Caryn Kaplan, Michelle Meskin, Sophie Bae and our new youth leader Shaina Aharon. Your dedication is tremendous, as each and every one of you go above and beyond your job descriptions, ensuring that Kadimah is what it is today. It is an inspiration to us all. I also want to take a moment to thank Nofar Boskila for her work in the shul as youth leader, having now taken on a new job. We are grateful for all your hard work and creativity in setting up the youth services. Last but not least, a very special thank you to Bernice Charif and her team of volunteers whom we rely on for so many different events in the shul. Thank you for giving of your time and energy to ensure the proficiency and productivity of Shul projects and events. Pesach is a celebration of the miraculous exodus from Egypt over 3 millennia ago. From that point on in history, the Jews seem to have gone through the same fateful cycle multiple times. A period of success, that generally led to being attacked for their great achievements, oppressed (often to the point of extinction) before overcoming the odds and outliving their tormentors. What is unique about the Jewish people is that we have punched above our weight and achieved success in so many areas from Torah expertise to scientific proficiency, despite our rocky history. I would like to suggest four crucial elements that are enshrined in Jewish thought and perhaps are the catalyst for G-d’s miracles. Hard work, education, family and traditions. Judaism has always stressed the importance of working hard and that the only true avenue to success is through toil. To quote from Psalms (126:5), ‘those who sow with tears, will reap with joy’. Similarly, the Torah mandates us to teach our children from a young age. The Talmud tells us that this applies not only to Torah, but also to teach our children a profession and even to swim. Indeed, Judaism is a religion that is centred on family; we bless the children; we celebrate our festivals with our families, and a husband is encouraged to buy gifts for his wife and children at the chagim. Finally, where would we be without our traditions? Some are universal, some depend on the country you came from and some may even be specific to one’s family, it is these morsels of tradition and custom that tie us to the generations before us. Collectively, these four Jewish fundamentals are what ensure our continued longevity. It seems that Pesach indeed reflects these four principles.We work hard in perfecting our Seder, cleaning for Pesach, saving money for the various expenses associated with the Chag. We do this in preparation for the great moment of the family getting together over Pesach. Still, the greatest focus on Pesach is surely the children, such that we conspire to make them central to many of the Seder traditions, including the Ma Nishtana and Afikoman. And lastly, tradition. Well, is there another festival in Judaism that is replete with so much custom and tradition? Pesach is full of symbolic customs and quirky remembrances. Indeed, the festival of Pesach brings these four crucial elements together in a unique fashion. As we enter the spirit of Chag, let us all let go of the pre-pesach stress and focus on this special time. Let us also commit to strengthening our values of hard work, education, family and traditions. The shiurim will take place right after the services in the men's section behind the Bimah. Men and women are welcome to attend. 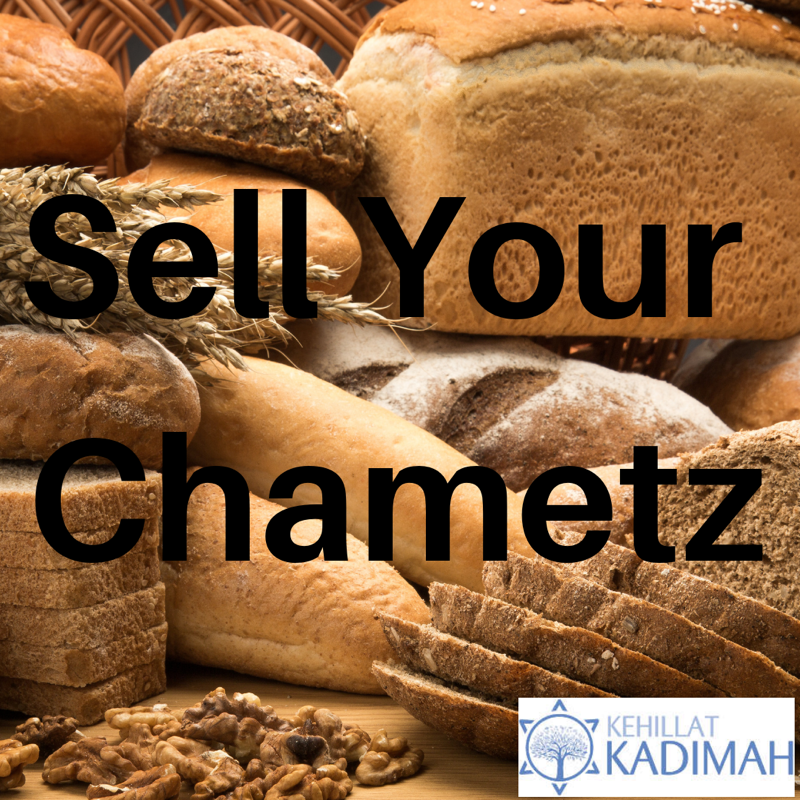 The 2019 Annual General Meeting of Kehillat Kadimah Limited will take place on Sunday 5th May at 7.00 pm. The Notice of Meeting (with Proxy Form attached) can be found at this link, with the 2018 Financial Statements with Audit Report available here. If you wish to lodge a proxy for voting purposes, this needs to be done by 3.00 pm on Friday 3rd May and sent to proxies@kadimahsydney.org. We always want to ensure that Kehillat Kadimah members feel like VIPs, and for men to have the opportunity to get an “honour” in the shule, particularly during Chaggim. 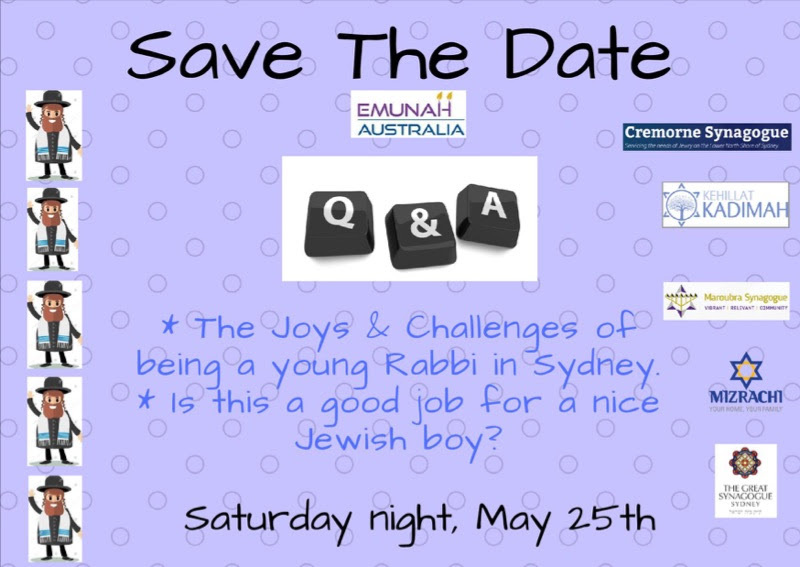 Please contact Mervyn Katz: gm@kadimahsydney.org should you wish to receive an Aliyah (call up to the Torah) or Pesicha (opening of the Ark) during Pesach. We will do our best to ensure we can accommodate all such requests. We wish long life to Mervyn Stein, Bentley Stein and Perle Greenberg on the passing of their mother Freda Stein ע׳ה in South Africa. 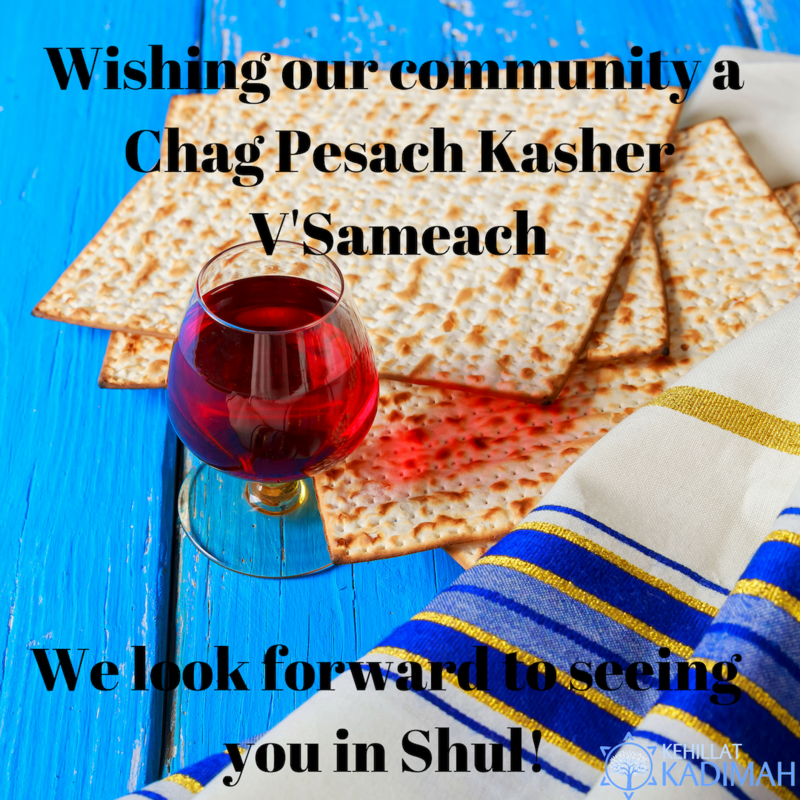 Thank you to the following people who helped pack our Shmurah Matzah. We appreciate your time and effort! Coby Sher, Ariella Badler, Liora Badler, Kayla Taitz, Alex Tanchel, Joanne Tanchel, Rachel Kaplan and Sarah Kaplan. Get excited for a fun-packed week of children's services, filled with seder-games, fruit snacks, prizes to earn and all kinds of Pesach fun! Please note - there is no children service in the evenings of Friday 19th and Saturday 20th April. Amongst the great features of our community is the caring and attentive work of the Bikkur Cholim team, led by John Temple and supported by several dedicated volunteers. Rabbi Rapoport and Rabbi Niasoff also make visits to ensure that members, as well as the parents and grandparents of members, who are in care facilities remain connected to our community even if they aren’t able to attend the shule as frequently as they would like to. Through these visits we have discovered additional people to visit and we need more volunteers to help with this important mitzvah. If you are able to spare a couple of hours once or twice a month, you can brighten the day of someone who might have a long standing connection to our community. This is open to all ages, and support material and guidance is offered to ensure visits are effective and make a good impact on the lives of those you meet. Similarly, if you know of someone in any of the local hospitals or aged care facilities, please do let us know to ensure that they remain part of the Kehillat Kadimah family. Please contact John Temple on 0412 233 166 to discuss. WOULD YOU LIKE TO SPONSOR A KIDDISH? Do you have a celebration coming up in the family? Or would you like to honour the memory of a loved one? Or do you just feel it is "your turn"? If you would like more information on sponsoring a Kiddish, please contact the office or Bernice Charif on 0410 303 934 for more information. The women's Mikvah is open.